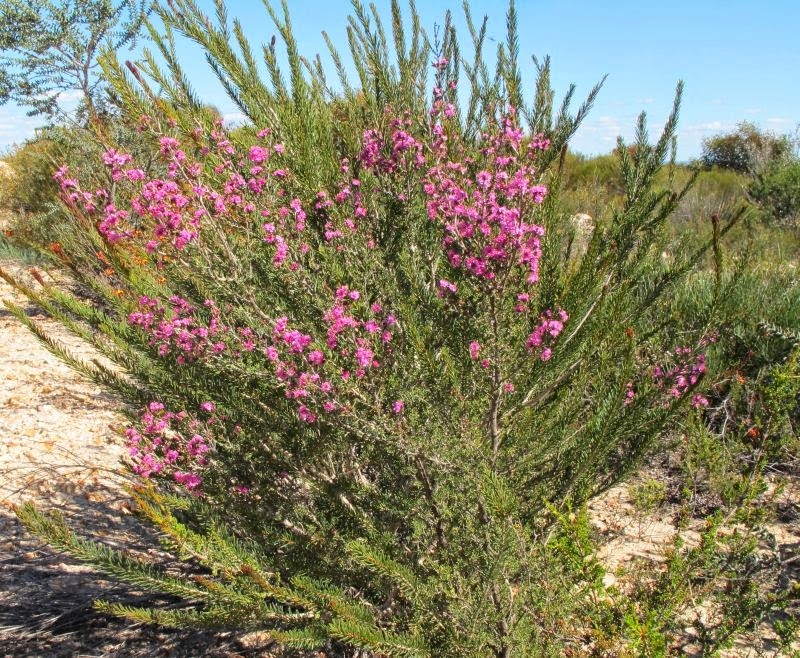 The bright pink/red flowers are certainly eye-catching and are produced on upright stems to 1.5 metres (5’) in height that sway in the wind. The lower bushier portion is dome shaped and around ½ metre (18”) in height and from where the several flowering stems are produced. Each stem is branched, then re-branched near its summit, with each tip producing a cluster of flowers to make a colourful display. Kunzea is superficially similar to several other genera, but is separated by collectively having a several-celled ovary (commonly 3-5 cells), each with several ovules (seeds). 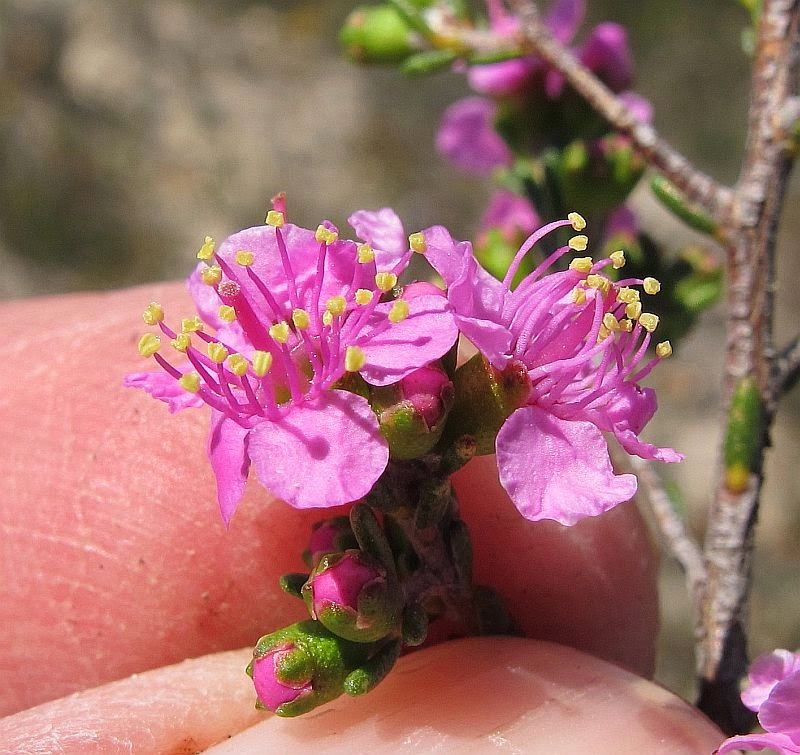 The stamens are free from each other, plus are as long or longer than the petals. The anthers are centrally attached to the filament and have parallel slits, plus the flowers are generally arranged in clusters. Kunzea affinis has small linear leaves, which are without hairs on their upper surface, but are usually hairy on the edge and toward the underside. The rounded calyx lobes, plus the calyx are also hairless, although young branches are covered in long appressed hairs. However there is another very similar Kunzea whose distribution overlaps with K. affinis in its western sector, this is called Kunzea jucunda. 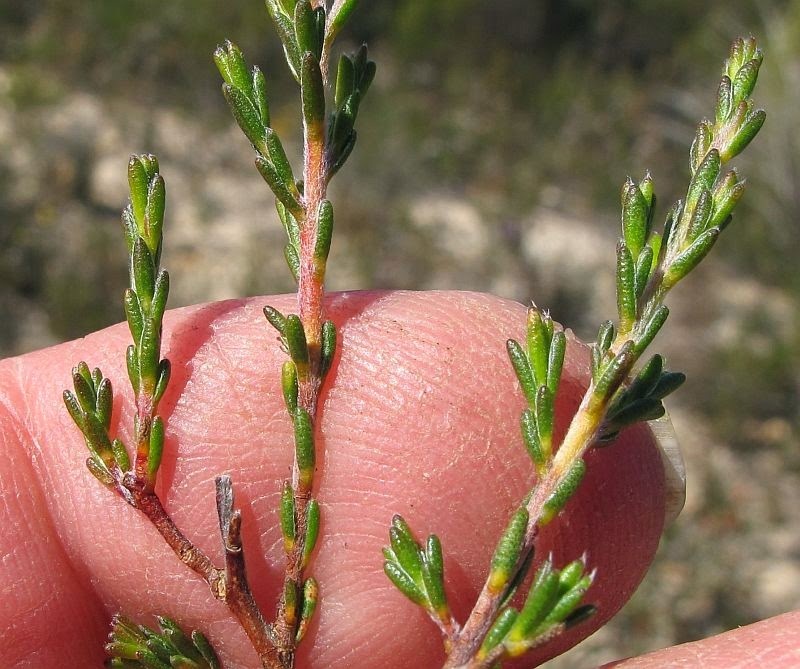 With this species the leaves are elliptical instead of linear and are without hairs, plus the young branches have no to very few hairs. 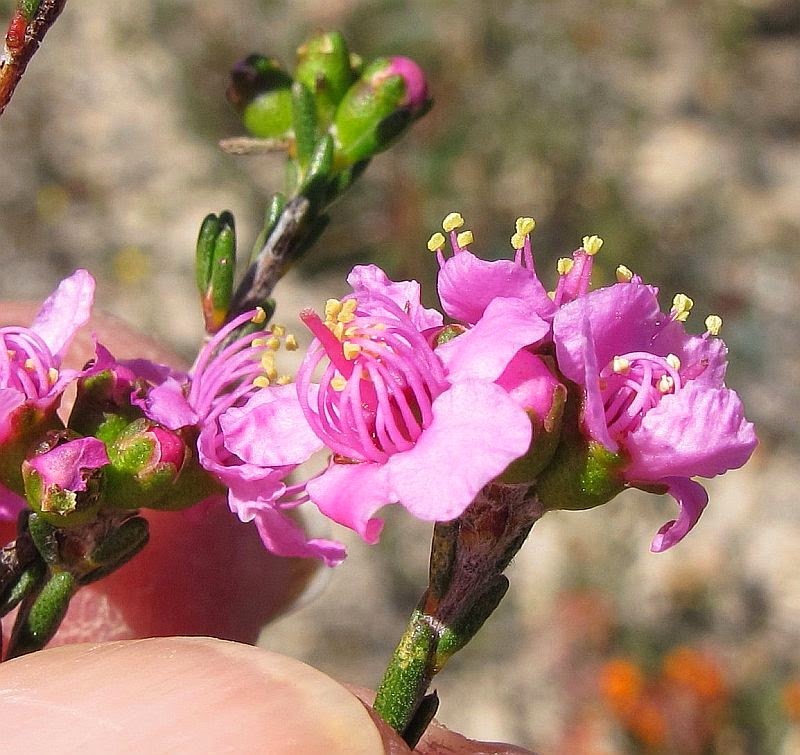 Also the bracts surrounding the floral clusters are hairless except for a frill around the edge (the bracts of K. affinis on the other hand, are distinctly hairy on the outside). Just to really throw the cat among the pigeons, hybrids between the species above and others are known to occur, so if you find a Kunzea very similar, but not quite fitting the above description, it might be one. 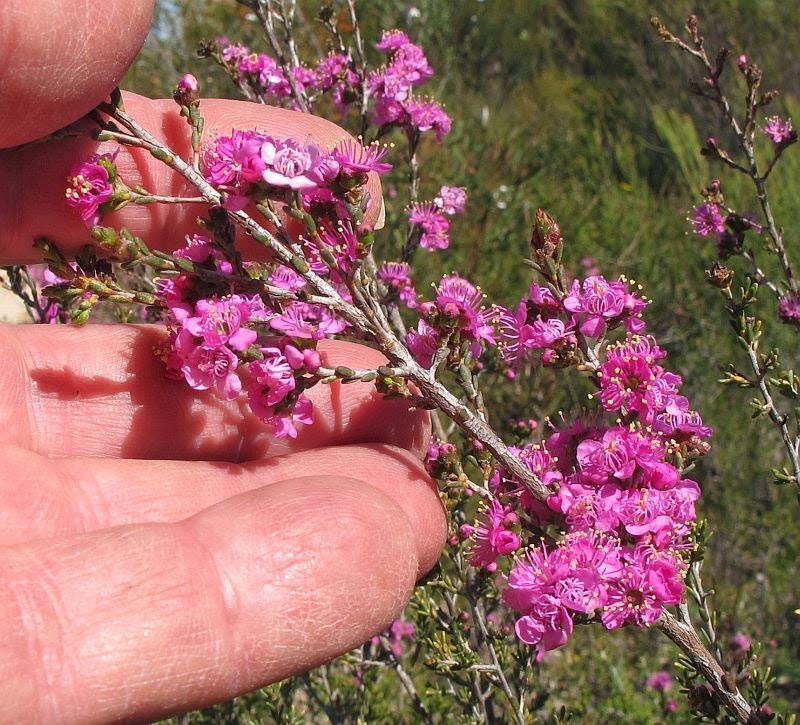 Returning to Kunzea affinis, they can be commonly found from the Stirling Range (NE of Albany) to 100 km (62 miles) west of Esperance, then less frequently north of Esperance and east to Israelite Bay. 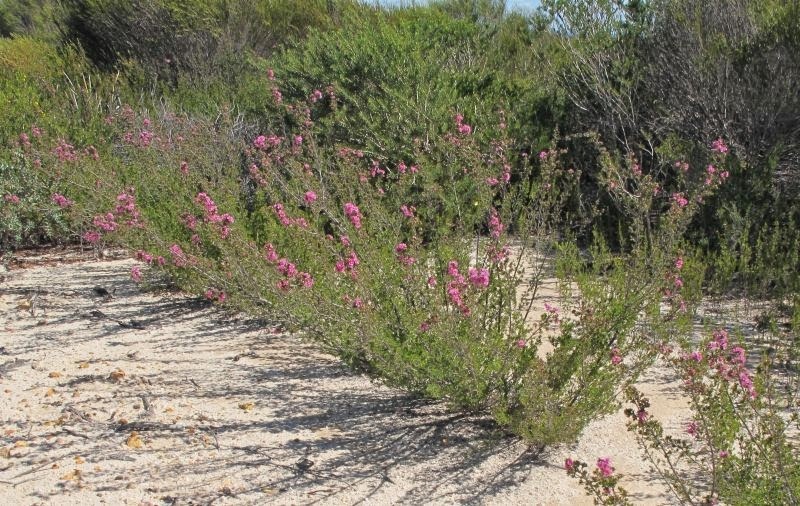 Locally, the most favoured habitat for this plant is a sandy soil over gravel or rocks (broken granite), it can also be encountered on disturbed roadside edges. 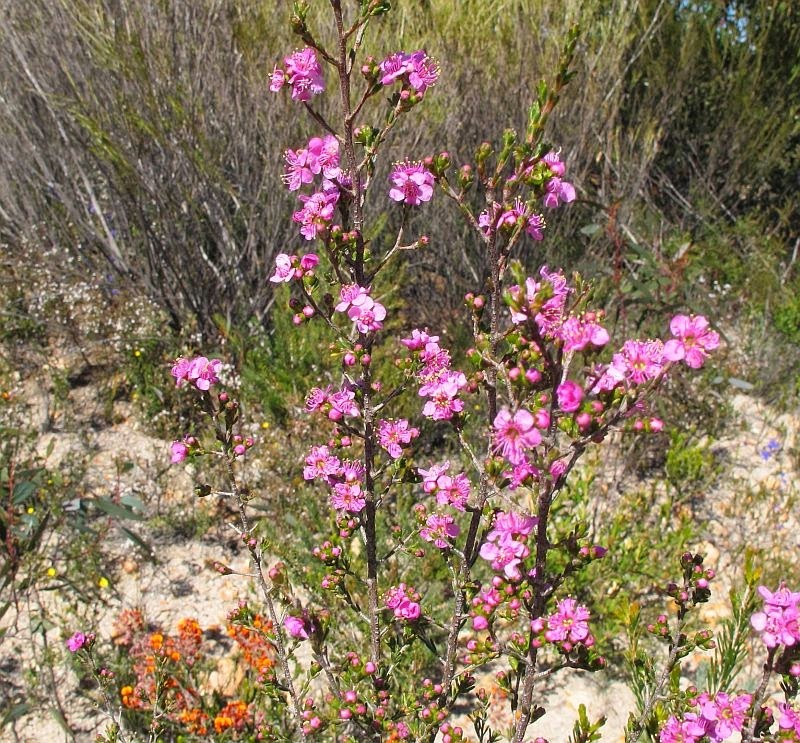 In a low heath environment the shrubs can be peppered over a wide area, but when not in flower it is easily overlooked amongst plants with larger and more dominant foliage. Flowering time is from August to October. 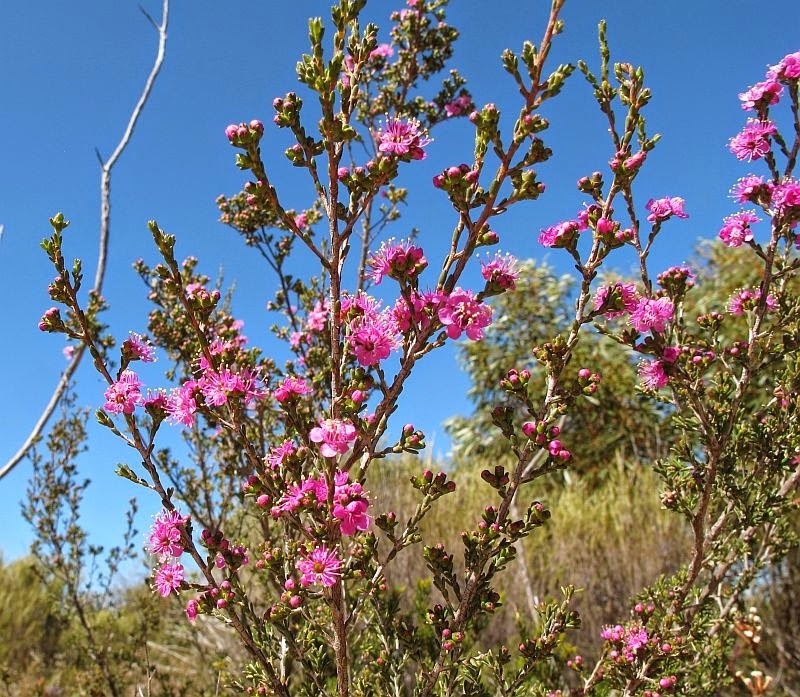 Kunzea is part of the very large and highly diverse Myrtaceae family.